Birgit offers horsemanship clinics, workshops, and short courses on various topics based on the methodology of Irwin Insights (Chris Irwin). The number of participants in Birgit’s horsemanship clinics, workshops, and short courses is limited in order to facilitate the most conducive learning environment possible and to ensure plenty of individual attention and instruction. If you have a group of people who are interested in participating in any of Falling Star Ranch Academy of Foundational Horsemanship’s horsemanship clinics, workshops, short courses or demos, Birgit can put something together to fit the needs of your group, either at Falling Star Ranch Academy of Foundational Horsemanship or at your facility. This one-day workshop is great for the novice horse person or anybody getting back into horses after some time off. It is also great for parents of horse-crazy kids who want to learn how to be safe around horses and would like to understand how horses think and why they react the way they do. In this workshop, you will learn (and/or improve your skills) how to properly and safely catch, lead, tie, and groom a horse, and how to pick out its feet. Feeding, stable management, hoof care, tack care, illnesses, diseases and injuries in horses, types of breeds and riding styles are also topics that will be covered. We will also talk about proper tack and different types of bits, saddles, bridles, etc. A big focus during the workshop will be on equine body language and psychology. This workshop can also be turned into a two-day event, with the second day including round penning and lungeing and even long-lining/ground-driving. This workshop doesn’t include any riding. Horses will be provided at no extra cost. Maximum 12 participants for one-day workshop. Maximum 8 participants for two-day workshop. $100* per person per 1-day workshop. $200* per person per 2-day workshop. Auditors are welcome on the second day of this workshop. *Prices are based on events taking place at Falling Star Ranch Academy of Foundational Horsemanship. Please inquire for mileage to other locations. In this intensive, one-day workshop, Birgit will demonstrate how to round pen a horse effectively and safely and then coach each participant in a one-on-one session. Round pen training leads to incredible break-throughs with horses and lays the foundation for better communication, trust, respect, confidence, focus, and willingness. Round penning is also a great tool to overcome various problems and to prepare the horse for work under saddle. Participants will learn the differences between predator and prey behaviour, learn to understand how horses think and why they react the way they do, get insight into equine body language and psychology, and learn how to speak the language of the horse themselves. Participants will also learn about the different types of horses (passive, passive-aggressive, aggressive) and how to communicate with each type. Other complimentary ground work techniques such as in-hand leading and lungeing may be taught as well. Become a benevolent leader to your horse, learn to assess the unique qualities of your horse’s personality and to address a variety of challenges through proper round penning techniques. This is a great opportunity for those of you who want to have a better relationship with their equine partners. Horses will be available for this workshop at no extra cost, but you are welcome and encouraged to bring your own horse as well. Please call Birgit at 1-250-968-6801 or email for health requirements if you would like to bring your own horse. Auditors are welcome at this workshop ($25 per person per day). This two-day clinic is geared towards horse owners with young horses and those horse owners who would like to learn how to improve their horses’ ground manners and build a positive relationship based on mutual trust, respect, confidence, and willingness. You will learn about various ground work exercises such as in-hand leading, round penning, lunging, and possibly long-lining/ground-driving. Depending on the horses and participants, we will also be working with trail obstacles, handling behaviour problems such as biting, spookiness, aggression at feeding times, difficult to catch, difficult to trailer load, difficult to handle feet, not standing for mounting, not standing for fly spraying, head shyness, difficult to halter/bridle, etc. Develop a positive relationship with your horse based on mutual trust, respect, confidence and willingness by understanding how your horse perceives the world. Learn how to set boundaries and how to be assertive without being aggressive. Learn how to help timid horses become more confident and how to get pushy horses to respect your space. This clinic doesn’t involve any riding. Participants are encouraged to bring their own horses, however, Falling Star Ranch Academy of Foundational Horsemanship horses will also be available. Please call Birgit at 1-250-968-6801 or email for health requirements if you are bringing your own horse. $200* per person per 2-day clinic. Auditors are welcome at this clinic ($25 per person per day). If there is anything about the way you and your horse relate to each other that you would like to improve, be it on the ground or under saddle, you will be amazed by the results of attending a clinic with Birgit. You will get to know and truly understand your horse in a new and exciting way. You will learn key aspects of equitation and how to become a pro-active rider who rides from his seat and steers with his/her core. Birgit will help you improve your body position and timing, as well as your awareness of your horse’s rhythm and bend, enhancing communication with your horse and thus helping your horse become more confident, more willing, more responsive, more relaxed, softer and more focused. Sessions are private or semi-private, while the other participant’s audit. You will not be lumped into an arena as a group with everybody doing the same exercise and have instructions hollered at you. Instead, each session is tailored according to the needs of the participant(s) and their horse(s). You can book one session or multiple sessions over the course of the clinic. Focus on what you and your horse need to be your best – whether it be ground work only, riding only, or both. Whether your goal is to enhance performance, work on a specific training issue, or solve a behavioural problem, whether you would like to improve your confidence, your body position, or your timing, or your awareness of your horse’s rhythm and bend, or whether you would just like your horse to become lighter, softer, more confident, more responsive, more focused and more willing, Birgit offers individualized attention so that everyone gets real answers and real results. Clinics can be as short as one day or up to six days. There is the option of a round pen demo the evening before the start of the clinic at no extra cost for clinic participants ($20 for auditors). This is a great opportunity to watch a clinic participant’s horse’s learning process unfold as Birgit demonstrates proper, effective, and safe use of round pen techniques and starts establishing a relationship based on mutual trust and respect with a horse. Watch as the horse becomes more relaxed, more confident, more focused, more respectful and more willing. This is an exciting, interactive demo where questions are not only welcomed, but encouraged. The demo is also a great opportunity to learn about equine body language and psychology before the start of the clinic, therefore maximizing your learning time during your session(s). Horsemanship clinics with Birgit are suitable for any level of rider, any age or breed of horse, and any riding discipline. $100* per person per day. Auditors are welcome at horsemanship clinics ($25 per person per day). Please call 1-250-968-6801 or email for more information or if you would like to host a clinic. Incentives for organizer! A horse can speak volumes using body language. But what exactly does all that mean? And how important is it that we know? Even without words, a horse has a lot to say. The ears, facial expressions, tail and other body parts provide clues to the horse’s emotional and physical state. Is the horse playful, mad, or fearful? Is it submissive or dominant? Reading your horse’s body language can help you have a better relationship with your horse and may even help you avoid being injured. This workshop focuses on equine body language and psychology. 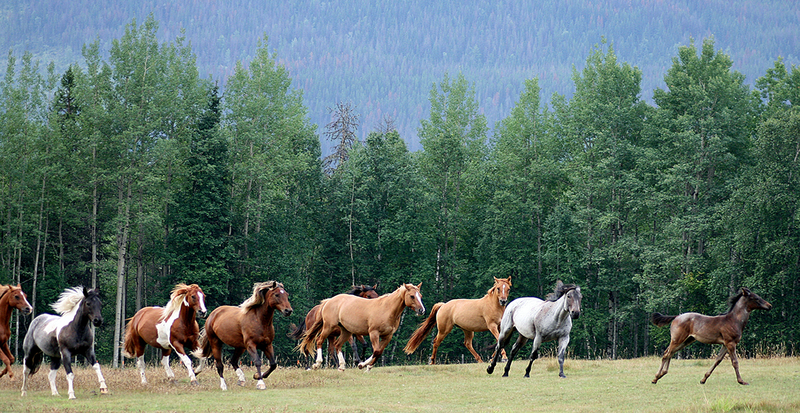 We start out by observing horses in a herd environment in the field. Participants will learn about herd dynamics and herd behaviour, the differences between predator and prey behaviour, and equine body language and psychology. We will then spend time in the round pen or indoor riding arena with a variety of horses and apply and reinforce what we learned in the field. Learn how to set boundaries and how to be assertive without being aggressive. Learn how to help timid horses become more confident and how to get pushy horses to respect your space. $50* per person per half-day workshop (3 hours). No auditors at this workshop. For more information or if you would like to host a clinic, workshop, short course or demo with Birgit at your own facility, please call Birgit at 250-968-6801 or send an email. Incentives for organizers! Help your horses to succeed; don’t test them to failure.